CCS recognises that you have many choices when it comes to choosing an IT partner to help support your business as it grows, and we know that is hard to differentiate between the “cowboys” and reputable suppliers. 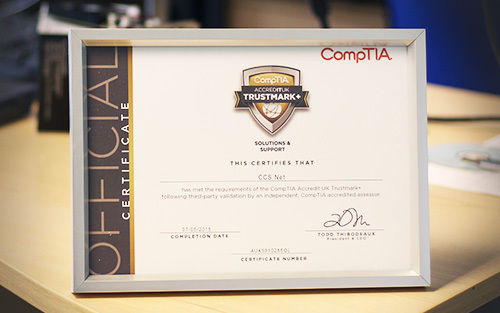 For this reason CCS are proud to have been awarded the Comptia Accredit UK Trustmark+. During this assessment CCS was able to provide documented procedures as well as implemented examples of these procedures being utilised in our day to day activities. To gain this endorsement, CCS must abide by industry standards that are stringent. This industry standard was formulated by experienced ICT specialists, as well as solution providers, traders and other suppliers. 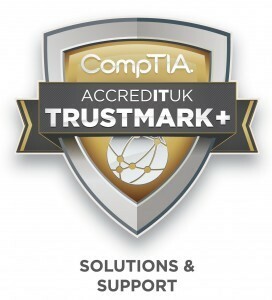 Look for the mark you can trust when deciding on an IT support provider, we are proud to be listed within the CompTIA Business Directory. Whether you choose to work with CCS or another provider we strongly suggest you look for this accreditation.